Gale's Pond is four miles southeast of Hart. There is a nature trail of about a half-mile that encircles the pond. This park is a small treasure with quality plant material along the trail, good birdwatching, and a picnic area. The pond was originally created to power a small mill which made shingles and broomsticks. A blacksmith shop was also located here and the area was served by a railroad. In 1939, Del Gale donated the property to Oceana County for a park. 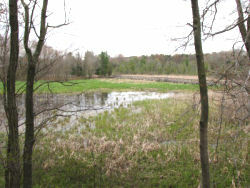 The WPA developed the area for that purpose, and more recently Michigan Recreation Trust Funds made the boardwalk at the south end of the pond possible. Description is counter-clockwise, beginning at the parking area. Leave the small parking area to the south on boardwalk which descends gently to lake level. There the boardwalk turns east and crosses a cattail marsh and two inlet streams at the south end of the pond. Once across, the boardwalk ends and the trail turns north along the east shore. Continue on natural surface to the north end of the pond. Cross a plank bridge over another inlet creek. This area is sometimes muddy and the west end of the bridge may be very wet. Continue on natural surface, turning west, until reaching another boardwalk that spans a wetland area. Trail climbs slightly to higher ground and reaches Fillmore Road. Cross Fillmore Road at an angle and continue in the woods turning south again. Cross Halftile Creek on a wooden bridge- be sure to look upstream and see the water coming over the dam. The trail soon exits the woods, and continues across a mowed area beside a house. Cross Fillmore Road again and return to parking area. Picnicking- There is one grill and three picnic tables near the parking area. One more table is located on the other side of Fillmore Road. Fishing- You could fish Gale's pond in a small boat (not good access) or from the shore. Possibly you could fish from the former road bridge above the dam. No information on what kind of fish may be present. Boat Launch- There is a small dirt area that slopes moderately steeply into the pond. It would be possible to hand carry a canoe or small rowboat down to the water, but there is no vehicle access boat ramp. Interpretive Signs- There are 21 numbered posts which mark various plants and trees. Oceana County is revising the brochure to explain these locations. Hopefully, it will be available soon. Access- via dirt Fillmore Road from the west to parking area. Note that Fillmore is closed to vehicle traffic at the bridge over Halftile Creek. You could drive in from the east side and park at the end of the road, but just be aware that the road does not go through. Ecosystem- man-made inland pond, cattail marsh, stream edges, bottomland hardwood swamp- somewhat unusual that there are three small inlet creeks for this tiny pond, and one outlet- the location where this pond was created was originally chosen with care.